Introducing the stylish Pink and Purple Butterfly Baby Bedding Collection set by Sweet Jojo Designs. This classic girls Butterfly Bedding theme will create a fresh spring-time look for your little girls room all year round. This set uses the trendy color combination of pink, purple, sage green, and yellow and is made using 100% cotton fabrics. There are detailed embroidery works and appliques of butterflies and flowers to give this set a timeless designer look that is perfect for any girl�s room. This Sweet Jojo Designs set will fit all standard cribs and toddler beds and is machine washable for easy care and repeated use. The blanket is constructed in a flowering quilted design combining assorted butterfly and flower appliques. It is finished with a coordinating pink, purple, green, and yellow color block border. A truly perfect butterfly baby bedding ensemble. The crib bumper uses a patchwork style that combines these beautiful pastel colors, and is also adorned with detailed butterfly and flower appliques. It is set off nicely with thick purple ties. The pink coordinating crib sheet is 100% cotton for ease, comfort, and repeated use. This Sweet Jojo Design sets comes with (2) window valances. These tab top valances are made with the pink fabric and feature a bottom row of coordinating color blocks. 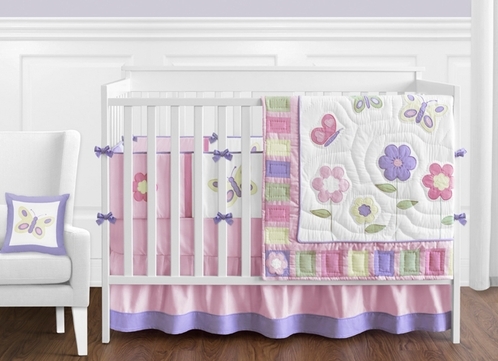 The gathered pink crib skirt with detail purple border, gives the fully dressed crib a finished look. The diaper stacker uses the coordinating fabrics and appliques so you can hang it on the crib or a hook to complete the look of your nursery. The Oh So Cute toy bag is a definite bonus. The toy bag has 4 pockets. It is great for holding toys, bottles, stuffed animals, etc. It can be easily hung by its own sets of ties. This adorable decorative pillow with large butterfly applique can be used anywhere in the room. What a charming finish to this incredible girls butterfly bedding set!